NEW DELHI, July 24  Rains continued to lash parts of Gujarat, Assam and Bihar as the death toll in house collapses, landslides and flooding of rivers across the country rose to 273 today. CHENNAI, July 24  The Union Home Minister, Mr L.K. Advani, today asked the international community to realise that Pakistan had a policy of cross-border terrorism and a "rogue army" that had "autonomous power". KOHIMA, July 24  The Comptroller and Auditor-General has unearthed the biggest financial scandal of the country in the Nagaland State Lotteries amounting to Rs 38,297 crore. NEW DELHI, July 24  The Delhi police arrested four other accomplices of Madan Bhaiya who was nabbed yesterday along with three others and one of the gangsters, Shri Ram alias Siriya Pahalwan was shot dead in an encounter with a team of the Crime Branch. NEW DELHI, July 24  Champaran Vikas Party President and Bihar MLA Dilip Varma today claimed that a mega scam in the red card scheme introduced for subsidised food grains for the people below poverty line had taken place in the state and demanded a CBI probe into it. NEW DELHI, July 24  Worried at the negative fallout of the merger with some of the parties of the erstwhile Janata parivar, the BJP has decided to sink its differences over the issue, saying that Prime Minister Atal Behari Vajpayee had no inkling of the efforts being made in this direction. NEW DELHI, July 24  The BJP is confident of winning at least one Lok Sabha seat from Kerala in the coming general elections. NEW DELHI, July 24  The Election Commission today reserved its order on the Nationalist Congress Partys request for the charkha (spinning wheel) as its poll symbol. NEW DELHI, July 24  In the continuing action against those opposed to aligning with the BJP, the Janata Dal President, Mr Sharad Yadav, today sacked the President of the Tamil Nadu Dal unit, Mr G.A. Vadivelu. NEW DELHI, July 24  The Yamuna river, which has been flowing above the danger mark, began to recede today. NEW DELHI, July 24  The Supreme Court has ruled that contraband seized from a person, during a search conducted in violation of the safeguards provided in Section 50 of the Narcotic Drugs and Psychotropic Substances Act, 1985, cannot by itself be a proof of unlawful possession of the illicit article. NEW DELHI, July 24 (UNI)  Rains continued to lash parts of Gujarat, Assam and Bihar as the death toll in house collapses, landslides and flooding of rivers across the country rose to 273 today. In Guwahati, at least nine persons, including two women and a child, were killed last night in a rain-triggered landslide in Bhaskar Nagar area, the police said. Six persons were injured. In Bihar, the toll in rain-related incidents rose to 133 as the flood situation deteriorated further, following a rise in the water level in rainfed rivers. Two more deaths were reported from Khagaria district today. Flood control cell sources said the flood threat to Patna district had increased following the rise in the level of the Punpun river. The river was flowing above the danger mark at Shripalpur by 139 cm and was expected to rise by another 11 cm by tomorrow morning. The toll in Gujarat rose to 35 with one death reported in the past 24 hours. A woman of Rajpipla town in Nadol Taluka was drowned in the Karjan rivulet. A report from Guwahati said two boulders came rolling down the Kalapahar hill before dawn following heavy rains and struck colony Bazar killing five, including three of a family, on the spot. One person died on the way to hospital while three succumbed their injuries at the hospital. A two-year-old girl was reported missing. Six of the 16 persons in the hospital were stated to be critical while 18 had been discharged after first aid, the sources said. Six houses were destroyed and some others partially damaged. Those who died were identified as Pramila Devi, Ojai Nath Prasad, Suraj Prasad (members of one family), Subelal Prasad, Sukurani Sen, Utpal Roy, Ujjwal Roy, Kashmiri Devi and Lali Kumari. Eye-witnesses said before dawn a boulder came rolling down the hill and hit a house killing three members of the family. A girlchild of the family was reported missing while a five-year old boy was battling for his life. This boulder was followed by a bigger one which came into contact with the first one and was shattered into pieces. The splinters hit neighbouring houses, destroying some completely and damaging others partially. People came out of the houses screaming and started rescue operations with torchlights but were hampered in their efforts due to rains and slush. Some informed the nearby Fatashil Ambari police station and senior district administration and police officials rushed to the site. The houses, mostly thatched, were built on the hill without any retaining wall. Reckless earth-cutting of the hill made these vulnerable to landslides, district officials said. Kamrup Deputy Commissioner D.N. Saikia has announced an ex-gratia of Rs 10,000 to the next of the kin of the deceased. Chief Minister Prafulla Kumar Mahanta condoled the deaths. A report from Patna said the flood water from Burhi Gandak river had inundated fresh areas in east Champaran district following a breach in its right embankment. A Darbhanga report quoting Divisional Commissioner Girish Shanker said the floodwaters had submerged 695 villages affecting a population of more than 50,000 in the division. He said the administration was increasing the number of relief centres in the affected areas. Central Water Commission sources said the Bagmati river was flowing above the danger mark at Hayaghat and Benibad by 118 cm and 43 cm respectively. The Adhwara group of rivers crossed the red mark at Ekmighat by 70 cm. Kosi was overflowing the danger mark at Baltara by 111 cm while it had crossed the red mark at Basua. The Ganga was also maintaining a rising trend at Farakka. Bihar Pradesh Congress Committee (BPCC) President Sadanand Singh asked Prime Minister Atal Behari Vajpayee to immediately send a central team to make an on-the-spot study of the flood situation in Bihar. Criticising the Centre for its alleged apathy towards providing assistance in relief measures to the flood-hit, he said the Prime Minister should also undertake a visit to the state to assess the magnitude of the damage caused by recurring floods. CHENNAI, July 24 (PTI)  The Union Home Minister, Mr L.K. Advani, today asked the international community to realise that Pakistan had a policy of cross-border terrorism and a "rogue army" that had "autonomous power". Addressing BJP workers at the party headquarters here, he also attacked the Congress for ridiculing Prime Minister Atal Behari Vajpayee's bus trip to Lahore. Mr Vajpayee's Lahore trip had brought about a major change in world opinion towards India as it established New Delhi's bona fide that it had honestly extended the hand of friendship to Islamabad, he asserted. New Delhi scored a major diplomatic victory by the visit. Never in the past five decades had Pakistan been isolated in the world as it was now and had suffered a major setback in its proxy war against India, he said. Effective handling of the Kargil issue had come as a "crowning achievement" of the Vajpayee government and boosted the Prime Minister's image, Mr Advani said. The Home Minister said during the 15-month tenure of the BJP-led government there were a series of achievements starting from the "Pokhran blasts to resolving the Cauvery dispute and an excellent Budget which gave a healthy resurgence to the economy". On Congress criticism of the handling of the Kargil issue by the government, Mr Advani said all countries were reaping encomiums on India for handling Pakistan's "naked aggression". Referring to a recent Congress resolution on Kargil which "primarily targeted Vajpayee", Mr Advani asked whether the Congress was bent upon committing harakiri. Stating that the "duly elected" Vajpayee government was "short circuited" by the Congress and "one of our allies" (AIADMK), Mr Advani said the Congress had to answer why it had inflicted the elections, costing nearly Rs 1,000 crore, on the people. In Tamil Nadu, he said, one principle reason why the AIADMK was angry was it wanted the Vajpayee government to dismiss the DMK government but Mr Vajpayee made it clear that the government was committed to upholding the Constitution in its true spirit. Meanwhile, Mr Advani and Tamil Nadu Chief Minister M Karunanidhi today held talks on sharing of seats between the BJP and the DMK for the coming Lok Sabha elections. The talks, which lasted over 30 minutes, were satisfactory, Mr Advani and Mr Karunanidhi told reporters separately after the meeting. Mr Advani said the BJP's Tamil Nadu unit leaders would hold further discussions with the DMK on identification of the constituencies and number of seats to be contested by the BJP in alliance with the DMK. NEW DELHI, July 24 (PTI)  Champaran Vikas Party President and Bihar MLA Dilip Varma today claimed that a mega scam in the red card scheme introduced for subsidised food grains for the people below poverty line had taken place in the state and demanded a CBI probe into it. Addressing a press conference here, Mr Verma alleged that the wheat and rice procured at a subsidised rates from the central pool for distribution to red card holders were being sold at higher prices in the black market and also in neighbouring countries like Nepal and Bangladesh. Under the red card scheme, the beneficiary is given 10 kg of rice or wheat at the rate of Rs 4 and Rs 3 per kg, respectively, he said. But, lakhs of quintals of rice and wheat procured at subsidised rate since June 1997 till March 1999 were sold at a premium of Rs 10 and Rs 7 per kg, respectively, in the black market, he alleged. Though over two lakh persons have been covered under the scheme, only a few were fortunate to get the grains that too once or twice since June 1997, Mr Varma claimed. He claimed that Rs 1,290 crore had been gobbled up so far, which is the biggest scam in Bihar after the fodder and bitumen scams. Mr Varma said he had been raising this issue from time to time in the Bihar Assembly and also took up the matter with Bihar Food and Civil Supplies Minister, but there was no favourable response. He has now written letters to Prime Minister Atal Behari Vajpayee and President K.R. Narayanan for their intervention in the matter, Mr Varma said. The Union Home Minister, Mr L.K. Advani, who has authored the script for dispelling the popular perception that Mr Vajpayee had bypassed the party by blessing the joint move of Defence Minister George Fernandes and Commerce Minister R.K. Hegde to bring in a faction of the Janata Dal into the National Democratic Alliance (NDA) fold, said the Prime Minister was not aware of the merger plan. Mr Advani, who held consultations with senior leaders of the party over the issue, decided that since Mr Vajpayee was the BJPs unique selling point (USP) in the coming Lok Sabha elections,the entire party must rally around the Prime Minister. Since Mr Vajpayee enjoys a higher degree of credibility, it would be best to project that the Prime Minister had no inkling about the merger move. Claims of Mr Fernandes and Mr Hegde to the contrary would carry no conviction with the people and the party members, the BJP strategist observed. Yesterday, the BJP Vice-President, Mr J.P. Mathur said that Atalji ki sahmati ke bina unhone (Fernandes-Hegde) merger ki ghoshna kar di (They announced merger without the consent of Mr Vajpayee). Today, another party Vice-President, Mr K. Janakrishnamurthi, said in a similar vein that Mr Vajpayee was not informed about the merger move. The party General Secretary, Mr M.Venkaiah Naidu, also denied that there were any divergence of opinion in the party on the issue of a Janata Dal faction evincing interest in joining the NDA. Talking to the media in Chennai, Mr Naidu said when the issue was yet to be discussed at the NDA as well as the party forum , there was no question of any differences over the issue. While the party would continue to stress that the merger move did not enjoy blessing of the Prime Minister, the issue would be discussed at the NDA meeting scheduled for July 31 in the Capital,the sources said, adding that finally the BJP would accept the merger move and ask the Lok Shakti to adjust the Janata Dal faction in Karnataka in its quota of seats. The Union Home Minister, Mr L.K. Advani, will be launching the National Democratic Alliance (NDA) at Cochin on July 27. Some smaller parties from the state will be joining the NDA on that day, the BJP Vice-President, Mr K. Jana Krishnamurthy said here today. Kerala, once considered an impregnable fort for the BJP, is now ready to send a party representative to the 13th Lok Sabha, another senior party leader said. The CPMs decision to support the Congress at the Centre has helped the BJP to strengthen the party base in the state which has been ruled till now by the Left Front and the United Democratic Front. The CPM cadres at the grass roots level have been crossing over to the BJP for some time now, Mr Krishnamurthy said. Till the CPM stalwart, late E.M.S. Namboodaripad, was alive, the party had maintained a distance from the Congress but now the situation has radically changed, another BJP leader observed, adding the anti-Congress CPM cadres were more willing to join our party. The non-Congress political space would now be occupied by the BJP in due course of time, he said. Talking of the chances of the NDA in the South, Mr Krishnamurthy said, We expect to win at least 35 seats in Tamil Nadu. The AIADMK and the Congress would manage to get between four to five seats, he said adding that the NDA would have a comfortable majority in the 13th Lok Sabha. The four arrested accomplices had been identified as Vikram Khari, a cousin of Madan Bhaiya, Arun Kumar, a travel agent in Connaught Place; Sanjay Kumar of North-East Delhi and Jaggi alias Jagjit Prasad Kasana of Sahibabad, Deputy Commissioner of South district Sudhir Yadav said. The DCP said the gangsters were waiting for Madan Bhaiya near Bihar Bhavan. Madan Bhaiya and his four accomplices had come to Ashoka Hotel yesterday finalising the strategy for collecting the ransom from Swatantra Rastogi whom they kidnapped on July 11 from the Delhi-Meerut road. They were hatching a planning to kidnap an influential person in Delhi. 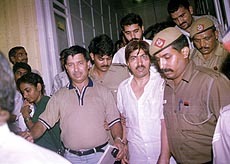 Acting on a tip-off that accomplices of Madan Bhaiya were waiting for him near Bihar Bhavan in Chanakyapuri in New Delhi, the South district police deployed a team there. When they received information on their cellphone about the encounter Siriya Pahalwan and the arrest of others they tried to escape. However, the police arrested them by intercepting their vehicle. The police seized two cars, (an Indica and a Maruti 800) and one .30 Mauser. The Indica car was owned by Madan Bhaiya. All weapons seized from the Opel Astra car yesterday in which Madan Bhaiya travelled were reportedly of Jagjit Prasad. The police said the kidnappers kept Swatantra Rastogi in Delhi Yesterday. He was moved after getting information about the encounter. The police is trying to rescue him alive. KOHIMA, July 24 (UNI)  The Comptroller and Auditor-General (CAG) has unearthed the biggest financial scandal of the country in the Nagaland State Lotteries amounting to Rs 38,297 crore. According to the CAG report, submitted recently in the state assembly, lottery tickets worth Rs 38,297 crore from the organisation of the state lotteries had not been credited to the government account. The entire scam took place between October, 1993, and November, 1997, when the sole distributor of the ticket, M. S. Associates, took the advantage of the lottery craze around the country by duping lottery-addicted people of major prizes. Lotteries were organised to help mobilise additional revenue for the state but because of a vague and loosely worded agreement between the Director, Nagaland State Lotteries, and the states sole distributor (SSD) M. S. Associates, audit found that only 0.105 per cent of the total turnover of Rs 38,297 crore was received by the government. The CAG report categorically said during those days, 83254 lottery draws were held under different schemes. In each of the 1,522 days, 55 draws took place each day and the turnover of each draw was Rs 45.75 lakh. Neither was the entire amount of sale of these draws amounting to Rs 38,297 crore deposited with the government, as it should have been, nor was the prize money given. The claim that 91 per cent of the face value of the ticket was paid as the prize money was not acceptable, said the CAG report. The modus operandi for looting money was very simple. The last digit lottery was on its peak demand during that period and very few actually bothered to look for the main prizes, and invariably the major prizes were never given and the money was quietly siphoned off by a nexus between M. S. Associates and the high-ups of the Nagaland Government . The CAG also found anomalies in selecting the judges for the lotteries, which were selected by the liaison officer of the Nagaland House in New Delhi without any authority from the government. Instead of three judges in most cases, there were 20 judges, while in 90 per cent cases, the names of 10 judges were not recorded. There was malpractice in declaration of prizes and the CAG found instances, where prize winning numbers were actually non-existent. Further, the results were never published in the Nagaland gazettes, but in local newspapers of the state. Meanwhile, the Chief Minister of Nagaland, Mr S. C. Jamir, denied his governments involvement in this biggest financial scandal of the country. He even charged the CAG with leaking the report to the Press. NEW DELHI, July 24 (UNI)  The Election Commission today reserved its order on the Nationalist Congress Partys (NCP) request for the charkha (spinning wheel) as its poll symbol. The commission reserved the order this afternoon after a hearing lasting two days, in the course of which it heard counsels on behalf of the NCP and the Congress. The Congress had contended that in the public mind, the charkha was associated with it and the NCP should thus not be given this symbol. The NCP, however, has disputed the Congress claim. It said the congress had no locus standi to object to the NCP request as the charkha was the registered symbol of the Indian Congress (Socialist), which had now merged with the Nationalist Congress Party. Following the merger, the NCP should be allowed to use this symbol, it says . Mr Vadivelu, who two days ago announced that the Janata Dal would ally with the Tamil Maanila Congress (TMC) in the coming Lok Sabha elections, was replaced by Mr A. Govindarajulu as the new president of the state unit. In a letter to Mr Vadivelu, Mr Yadav said his (Mr Vadivelus) announcement of aligning with the TMC was against the party decision to unite with the Lok Shakti and the Samata Party and join the National Democratic Alliance (NDA). The river was flowing a few centimetres below the danger mark set at 204.83 metres as excess water had not been released from Tajewala barrage, Haryana. The water-level this morning stood at 204.60 metres which further went down to 204.38 metres by this evening, a Flood Control Department official said, adding that the Yamuna was steadily receding. More than 5,000 persons living on the river-bed were shifted to safer places from parts of North, North-East and East Delhi as the river crossed the danger mark. The Flood Control Department has also been put on an alert. It has been asked to notify the Chief Minister, Mrs Sheila Dikshit, the Flood and Control Minister, Mr Yoganand Shastri, the Chief Secretary, Mr Omesh Saigal and the Development Commissioner immediately in case the water-level crosses the danger mark. NEW DELHI, July 24 (UNI)  The Supreme Court has ruled that contraband seized from a person, during a search conducted in violation of the safeguards provided in Section 50 of the Narcotic Drugs and Psychotropic Substances Act, 1985, cannot by itself be a proof of unlawful possession of the illicit article. Any other material or article recovered during that search may, however, be relied upon by the prosecution in other independent proceedings against an accused notwithstanding the recovery of that material during an illegal search and its admissibility would depend upon the relevance of that material and the facts and circumstances of that case, the court said.